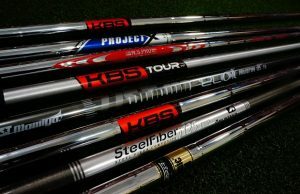 Is proper shaft weighting important? Are you consistently struggling to feel where the club is on your downswing? Does your club feel to light? or to heavy? If so, you shafts overall weight does not fit you. The weight of the shaft plays a big role in determining your control over the shot. If the shaft is to light then you might leave the club face wide open or shut the club face so closed causing the ball’s trajectory to be off. What’s happening here is the club shaft weight is so light the body will lose sense of where the club is at during the downswing. When this happens the body tries to make erratic movements to compensate and regain feeling of where the club is, resulting in shots that travel far off the intended target line. When the weight of the shaft is to heavy you can see similar results as a shaft that is to light, but contact tends to be much worse. If the shaft weight is to heavy one of the most common misses is to chunk the shot and miss it low left; otherwise known as a drop-kick. The other miss with a shaft that is too heavy is a low right miss. If you have ill fitted shaft in your bag you would be able to see any of these misses with irons, hybrids, fairway woods, and driver. The heaviest shaft in your bag should be in your wedges. As you get into the longer clubs the shafts get lighter. The order should be wedges, irons, hybrids or driving iron, fairway woods, and driver (heaviest to lightest shaft weight). Make sure to go double check your bag! For example in my bag: wedges have a 132 gram shaft, irons have a 130 gram shaft, fairway wood has a 79 gram shaft, and my driver has a 74 gram shaft. I tend to lean towards the heavier shaft as I seem to be able to control my golf ball more. There is a lot of room to experiment in the shaft world. For drivers and fairway woods you can go as light as 38 grams to as heavy as 100+ grams. Hybrids and irons can get as heavy as 147 grams and as light as 40 grams. There are a lot of different choices out there to experiment with. What I would recommend is go get fit by a PGA Professional after you have tried out a few different weights. The PGA Professional will be able to hone in on the exact weight that is going to fit you best no matter if your looking to just play or taking lessons and trying to improve your game. Give us a call when your ready to hone in your shaft weights and make golf fun again! 425-968-2477. So you think you can golf?